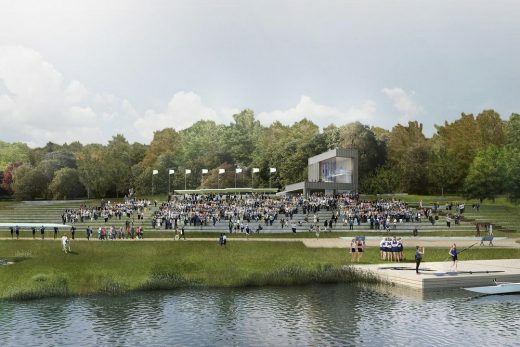 Denmark’s Rowing Stadium at Bagsværd Lake fulfils the vision of creating a rowing stadium in an international league of its own. Beautifully situated with water and forest on all sides, it is a place that accommodates both the elite and the broader public. Here, poised between lake and forest, the classical disciplines of rowing intersect with other forms of leisure. It is thus much more than a rowing stadium. It is a sports centre that mixes various kinds of sports with social and scenic experiences. It shows that sport – for the elite and the public – is not just about strength and stamina, but also social well-being and mental health. It is about the whole person, and that is precisely the starting point for the new national rowing stadium that, as a broadly inclusive framework in everyday life, helps to enhance the performance of the individual athlete. This has become possible through an unfolding of the site’s potential and by entering into dialogue with its different users. The result is a national sports centre that makes a difference for the individual athlete and gives something back to the scenic surroundings. 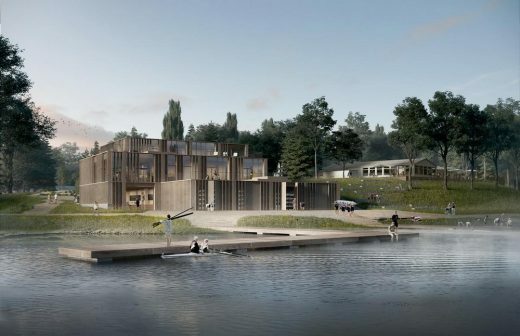 An open and welcoming rowing centre constitutes the focal point of the sports centre’s wide-ranging activities – from the activity space (Lunden) around the rowing centre and the promenade square in front of the boat hall (Brinken) to the unifying park stretch (Rostadionparken). Instead of being dug into the landscape, the rowing centre is built up from the boat hall’s grid structure into a transparent building clad with wood. 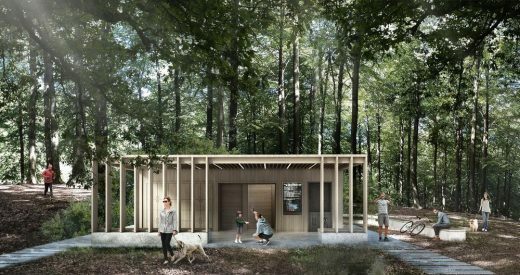 Outwardly, it opens itself up in several places, revealing its life to the surroundings while also providing a transition between the expansive view over the lake and the denser, recreational forest area. 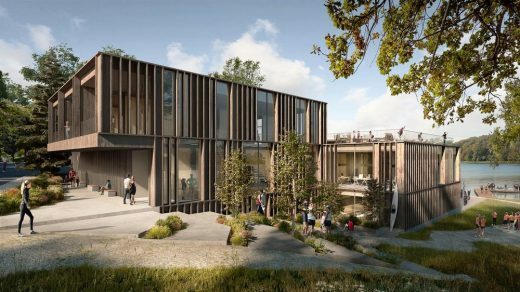 The transition between the lake and the forest is drawn all the way into the rowing centre, where the sloping landscape flows through the building and opens it up internally. 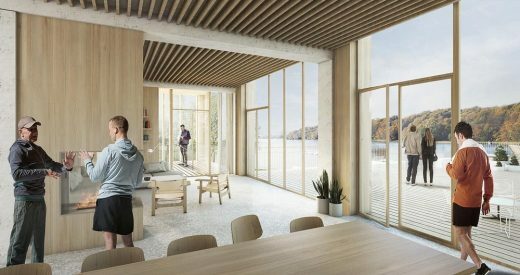 When moving around inside the building, one thereby has the sense of being situated in the field of tension between the lake and the forest – for example, both the foyer and the boat hall offer views into the forest and across the lake. The varying views across storeys and spatial features give the building a distinct transparency, so you always have the sense of being part of a larger community. Communality is characteristic of the rowing centre, where the foyer is designed to accommodate meetings before and after training. 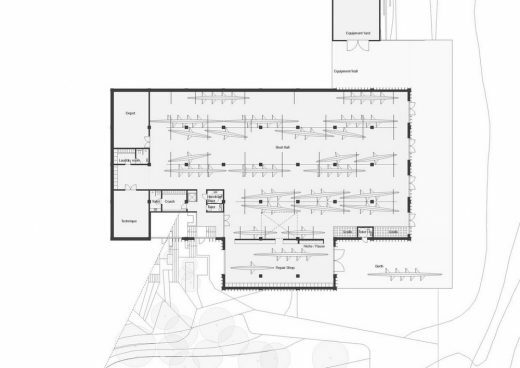 Throughout the building, there are nooks and crannies in which users can meet and engage, and throughout the centre, a close interplay has been created between the many functions: the foyer, boat hall, workshop, training room, multipurpose room, meeting rooms and administration. 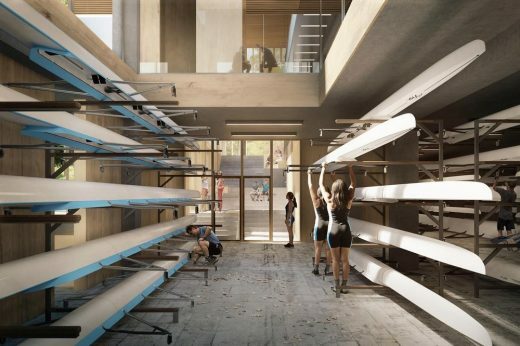 As part of the new national rowing centre, a referee tower will also be constructed. Inspired by the expanse of the lake and the forest’s soaring trees, the tower rises up to form a sculptural wooden structure. 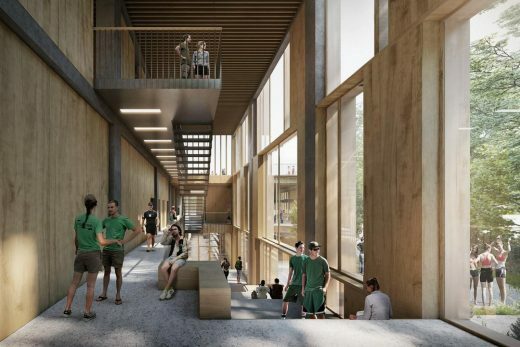 The façade’s pattern with vertical wooden slats gives the tower an architectural affinity with the rowing centre and a vertical expression that serves as a contrast to the horizontal lines of the spectator stands. The idea behind the tower is to create a construction that, by virtue of its materiality and simplicity, is naturally suited to the environment, but which simultaneously differs from it and constitutes a visual landmark seen from the lake. In addition, facing the forest, the tower has an integrated climbing wall and pull-up bars for outdoor training. Together with the covered terrace, this makes the tower an ideal destination for a wide range of users.